If you are one of those motorists who enjoy singing while driving, you’d appreciate upgrading your car’s sound system. Adding a 10 inch shallow mount subwoofer would be a good start. 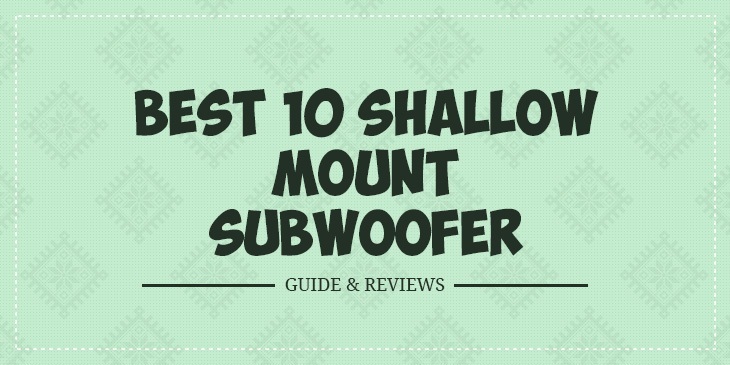 You can look for the best 10 shallow mount subwoofer models and choose the right sub for your car.There’s a reason why 10 inch shallow mount subwoofers are very popular among motorists. The best 10 inch shallow mount subwoofer can produce clear and responsive bass which can spell the difference in how you enjoy your favourite tunes. Moreover, shallow mount subwoofers don’t take up a lot of space in the car. These subs are also very easy to install. This is a solid choice for motorists looking to upgrade their sound system but worried about the lack of space in their cars or mini trucks. It can fit in tight spaces with its elevated motor structure. And it can give their sound system that extra bass. According to most reviews on Amazon.com, this subwoofer is surprisingly loud for its size. They describe the bass as deep and capable of rounding out the sound of a typical car audio system. Most reviewers say that it can give the deep bass for music types like electronic, hiphop, and even rock. Another good quality of this subwoofer is its dual 4-ohm voice calls. This would let you sub for 2- or 8-ohm impedance, so you’ll have more flexibility in setting up your system. It is also optimized for sealed and ported enclosures. It’s really up to you to choose the type of bass you desire in your ride. Many comments on Amazon.com indicate that this subwoofer has been used in mini SUVs like FJ Cruiser and mini trucks like Chevy Colorado. It can even be fitted in small cars such as the Jetta. Simply put it, this subwoofer is a great choice for motorists who don’t have ample spaces in their rides. There are some reviews, though, indicating that it can distort on heavy bass. However, you can avoid that by mating this with an appropriate amp. If you’re looking for a subwoofer that has more power, then this model should be in your shortlist. It has a peak power of 800 watts and RMS power of 500 watts. And it has a mere 4.41 inch mounting depth, so space won’t be much of a problem when you are installing this sub. The subwoofer’s con is made of treated paper, capable of resisting changes in temperature and moisture. This subwoofer works well whether you put it in an enclosed or vented enclosure. It may also produce clean, accurate bass when you mount it on a bandpass box. Regardless of the enclosure you choose for this sub, it should be able to handle high power well thanks to its high strength foam surround and dual layer convex spider. It also has an advanced cooling design so it can stay cool no matter no matter what happens. Finally, this is one of the more affordable subs in this list. Skar may not be as popular as other brands like Kenwood, Pioneer or Rockford, but it has a good reputation among audiophiles. However, it does have its flaws. Some comments I read on Amazon.com suggest the extension isn’t that low. Others say that it isn’t able to handle the bass when the volume is turned to high levels. Kenwood may be a brand that’s more familiar to you than the other names in this list. So there’s a likelihood you may opt for this sub than those from other brands. That’s not a poor decision at all, given that this 10 inch shallow subwoofer is packed in features. One of the best features of this shallow subwoofer is its mounting depth. At just 3.5 inches deep, this sub would fit well into the most compact places in your car. I’ve read a lot of comments saying that they’ve fitted this sub in small cars like Nissan Altima. With its shallow mounting, this also means you won’t have to exert a lot of effort in installing this sub. Its cone, meanwhile, is made of carbon glass fiber. It has a honeycomb pattern that is designed to deliver quick response without flexing. It is surrounded by beefed-up rubber that maintains control over the cone. It is also effective in reducing the distortion caused by the resonance. Finally, the sub is housed in a die-cast aluminium basket with lots of venting to keep it cool. This sub should work well with mono amplifiers with 200 to 375 watts RMS at 4 ohms. This model is backed by Kenwood with a two year limited warranty. You don’t need to have tons of space in your car to be able to install this subwoofer from Kicker. It can easily slide into the door panel of your car, and give your sound system an extra bass. With a mounting depth of a little over 4 inches, this Kicker sub will pose no problems for you even if you have a small sedan. And with its max power of 800 watts and RMS of 400 watts, this small but powerful sub can make your sound system really boom. Many reviews I’ve read on Amazon.com indicate that this shallow mount sub can deliver clear and accurate bass. That could be attributed to the injection-molded polypropylene cone of the sub. It can also handle extreme power thanks to its special four layer voice coil.According to most reviews on Amazon.com, the sub may be small but it can deliver satisfactory low ends. If you turn up the volume, the subwoofer can pound your ears as if it was a 12-inch subwoofer.This sub should be a good addition to small cars and mini trucks. A couple of reviewers on Amazon.com reveal that they’ve added this sub to their cars like GMC Sierra and small trucks like the Silverado.A word of warning though: to be able to get the best sound out of this sub, you should put it in a sealed enclosure. If you put them in a vented enclosure, the audio quality isn’t as good as advertised, according to some reviewers on Amazon.com. Rounding out our list of the best 10 inch subwoofers is this dual 2 ohm model from Kicker. It has an injection-molded polypropylene cone, with a mounting depth of 3-7/16 inches. It has a peak power handling of 800 watts and 400 watts RMS. This subwooder has a cone that is made of polypropylene. It is guaranteed not to flex and cause distortion thanks to its injection-molded design. Thus even when you crank the bass, you can be ensured that this sub can handle the increase in power. It also has a rubber surround that should last for years of heavy use. You’ll have multiple wiring options when setting up your sound system with this sub. You could wire the dual voice coils for 4- or 1-ohm total impedance. For best results, though, Kicker recommends putting this subwoofer in a sealed enclosure. Most of those who have bought and installed this 10 inch sub are satisfied with the bass it produces. They describe it as clean, accurate, and not overpowering. Even those who have used 12 and 15 inch subs before are impressed with the sound quality of this Kicker model, saying it is comparable to the bigger subwoofers they’ve used in the past. To get the best sound reproduction, this sub should be paired with an amplifier that is rated between 300 and 600 watts RMS. Whether you pick the Kicker subs, go with the Kenwood and Skar models, or choose the Rockford sub, you can be assured that you are getting a high quality shallow mount subwoofer. All of these subwoofers are highly rated on Amazon.com, with many of the people who’ve bought and installed them in their vehicles having good words for them. The consensus is that these subwoofers are very powerful despite their size. Other reviewers point out that the subs can deliver clean and accurate bass, even if the volume level is increased to high levels. Regardless of which sub you pick, here’s one recommendation I can give you--- make sure that you match it with the appropriate amplifier. Coupling the shallow mount subwoofer with the recommended enclosure could also make a significant difference in the kind of bass that the sub produces.